Major Global Earthquakes Over the Last 2,000 Years. | Chaos Sweeps Away the World We Know! The Disaster, current events & Catastrophe Blog. Forecasts for 2014 to 2022. Read tomorrows news today! Plus current economic, commodities, stock indices and financial news. Major Global Earthquakes Over the Last 2,000 Years. 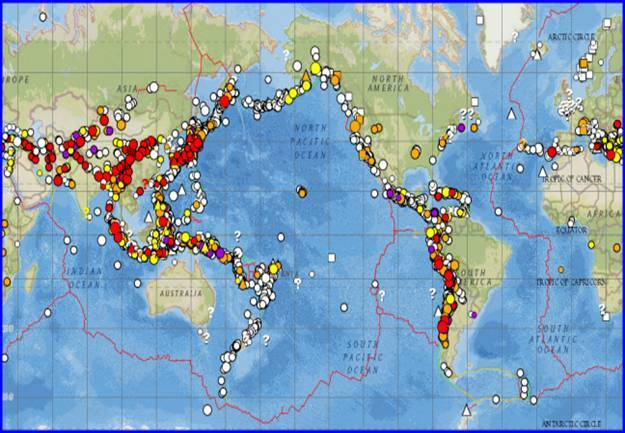 June 27, 2013 – Major Global Earthquakes Over the last 2,000 Years: The world map above was produced from the NOAA website. It reflects all global earthquakes greater than or equal to 7.0 magnitude. 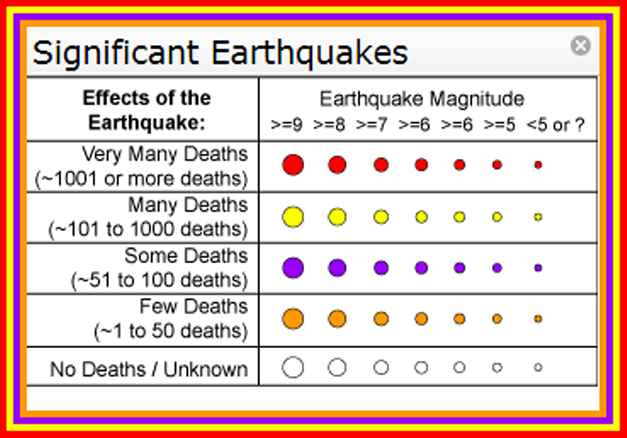 The legend shows earthquake magnitudes across the top and the effects of those earthquakes, in terms of deaths, down the left side. Generally, major earthquakes occur along the earths tectonic plates (the red lines on the map). However, this is not always the case. The Hawaiian Hot Spot and the New Madrid three major quakes in 1811 and 1812 are but two examples. Also significant are the number of destructive earthquakes in Europe. This does not bode well for the European Union. This entry was posted in Afghanistan, Africa, American Samoa, Argentina, Australia, Belize, Bolivia, Brazil, Canada, Chile, China, Countries, Cuba, Death, Disasters, Earthquake, Ecuador, Egypt, European Union, Fiji, France, Germany, Greece, Honduras, Iceland, India, Indonesia, Iran, Iraq, Israel, Italy, Japan, Libya, Madagascar, Mexico, New Caledonia, New Zealand, North Korea-N, Norway, Pakistan, Papua New Guinea, Peru, Philippines, Portugal, Russia, Samoa, Spain, Switzerland, Syria, The Kingdom of Tonga, The Sandwich Islands, The Solomom Islands, Turkey, United Kingdom, United States, Vanuatu, Venezuela and tagged Major earthquakes over the last 2000 years, The Master of Disaster. Bookmark the permalink. 11 Responses to Major Global Earthquakes Over the Last 2,000 Years. Very interesting … especially bearing in mind the increase in earthquakes in the last couple of years! … Mother Earth needs a break from our destruction of the planet! Yes, Mother Earth indeed needs a bread from our destruction of the land, sea and air or their will be dire consequences to pay in the future. I fear that we will not change. The years 2014 (April) and 2016 will be particularly harsh. Bill … I fear that 2012 will be the changing point of all our lives! … Things will begin to happen soon … Good things! Yes, it should be an interesting year. I hope you are right in that good things will happen. We will just have to wait and see. Reblogged this on Living in Phnom Penh. Mostly tsunami events. You can see the details on the NOAA website which is the source for the map as Bill said in the post. The legend implies that the map is for earthquakes (EQs) of all magnitudes. It would be interesting to see where on the globe the EQs >= to 7.0 for all witnessed and inferred, as well as a a time graph showing the frequency over that time. BTW It appears that the EQs over 6.0 have slowed in frequency in the last week. Hopefully this means that the underlying cause (personally i think it was due to a reordering of the Earth’s rotational inertia) has faded or, perhaps, tension is building for a more dramatic readjustment; as this post speculates. Most large earthquakes occur along the Pacific Ring of Fire so that is where the >= 7.0 events would be. A time graph of large events would be misleading because reporting has greatly improved, leading one to conclude that earthquakes are on the increase. USGS says this is not the case. Good point. That is exactly what i was thinking, but admittedly awareness of earthquakes has dramatically improved since the beginning of the “Cold War” and only the large earthquakes can be inferred from geology or history in the distant past.